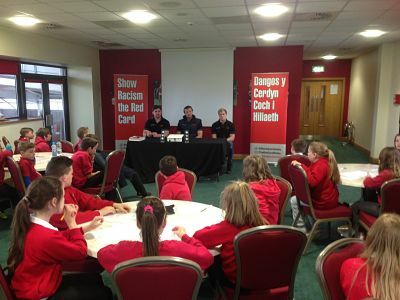 Young people from Penygaer Primary School attended Park Y Scarlets stadium to take part in the event for the day. Education Workers Chris Stokes and Noam Devey delivered a workshop in the morning to the young people educating them on the topic of racism using interactive activities and discussions. Scarlets players Aled Davies, Rob McCusker Hadleigh Parkes attended the event to take part in the press conference joined by Campaign Worker Jason Webber.